Commercial operations often require heavy duty, long lasting tarp covers, capable of withstanding Arctic cold or blazing tropical sun, and able to resist abrasion or chafing from wind and penetration by rain or snow. If you are looking for machinery or lumber tarpaulins, hay tarps, or any other kind of durable, heavy duty tarp cover, you need to learn which one is the right tarp for you. These super heavy duty industrial tarps are made with an extra-tough mesh weave of 420 denier polyester cords. They have a waterproof coating for water- and UV-resistance, and they have heat-welded corners and rust-resistant brass grommets every 2 feet along all 4 sides. 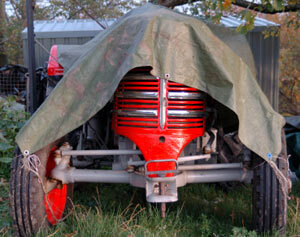 Machinery tarp covers that don't travel can use a lighter weight canvas or poly tarp. Hay tarps protect hay from moisture and UV rays. Commercial operations needing to cover lumber or machinery that is not in transit can use lighter weight canvas or poly tarp covers. Canvas or polytarp machinery covers are made with medium weight material with UV coating on both sides. Lumber tarps need to be particularly resistant to tearing and abrasion, and are made of heavy canvas or 1200 denier 6.5 ounce per square yard polyethylene tarpoulin material. Hay tarp covers can protect hay from soaking up large amounts of rain or melting snow or ice. Water can cause hay to rot, or to grow bacteria and fungi which can be harmful to livestock or humans. 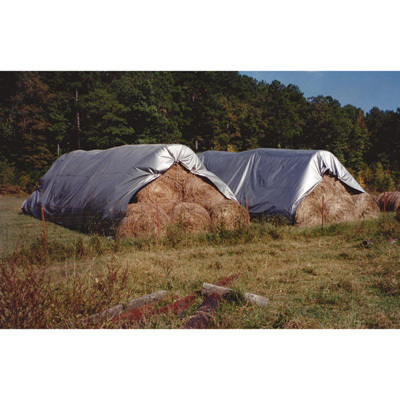 Heavy duty UV protected hay tarps also protect hay from excessive drying in the sun, which causes hay to become brittle and difficult to handle. Because they need to sit out in the elements for months on end, enduring sun, wind, and precipitation, hay tarps must be extra thick, water resistant, and must have a quality UV coating to protect them from degrading in the sunlight. Heavy poly tarp material of 1400 denier weighing 8.5 oz per sq yard is used for super heavy duty hay tarps.